Ryan Taylor shoots a jumper. The graduate shot over 42 percent from beyond the arc last season. Last year, junior forward A.J. Turner watched his Northwestern teammates play from the sideline. After transferring from Boston College — where the 6-foot-7 wing played for two seasons — Turner had to redshirt the 2017-18 basketball season. That meant no playing time, no road trips and no live game action. Now, Turner is eligible again, and with graduate guard Ryan Taylor, a fellow transfer, the duo have an opportunity to be two of the most impactful transfers in program history. Both have plenty of experience in their previous homes. Turner started 52 games and averaged almost 30 minutes of action over two seasons in Chestnut Hill, Massachusetts. As a sophomore, the Michigan native average 8.4 points per game and shot 37.4 percent from beyond the arc. In his redshirt year, Turner said he worked on improving all aspects of his game. Taylor — who was one of the top graduate transfer recruits last spring — played one season at Ohio and two at Evansville. 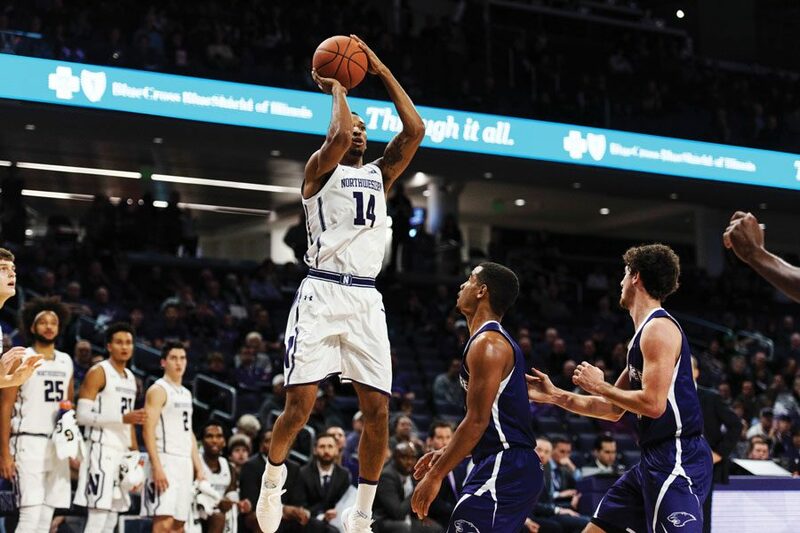 With the Purple Aces, he emerged as one of the best players in the Missouri Valley Conference. Taylor was first team All-MVC last season while leading the conference in points with 21.3 per game while shooting 42.4 percent from three-point territory. Before Friday’s exhibition against McKendree, Taylor and Turner were both projected to start. However, when senior center Dererk Pardon won the opening tip, Taylor was on the new Welsh-Ryan court, but Turner was not. Instead, freshman Miller Kopp occupied the forward spot opposite senior Vic Law. Turner was the first player off the bench — along with sophomore guard Anthony Gaines. During a few stretches throughout the game — when senior guard Jordan Ash and freshman guard Ryan Greer were both seated on the bench — Turner was the primary ball-handler. With the new offense system less focused on the pick-and-roll, Collins said there will be a by-committee aspect to the primary ball-handler position, and that Turner will see time in that role. Taylor said he sees himself as a two-guard but would not be opposed to running the point if Collins asks him to do so. In 17 minutes of action, Turner showed his multidimensional potential, scoring eight points, grabbing four rebounds, collecting two steals and dishing a team-high six assists. As for Taylor, he played a team-high 24 minutes and took a team-high nine three-pointers. He connected on three of them, and finished with 12 points. After just one game, the impact both Taylor and Turner can provide is evident. Taylor’s shooting ability and offensive prowess is at a level unseen in Evanston in years and Turner can be a jack-of-all-trades player, either in the starting five or as a sixth-man off the bench.